There's a reason why the license plates in Hawaii bear the image of a rainbow. I have never seen so many rainbows in one place in such a short amount of time. Not only that, but they lasted for a very long time. Here, when we are lucky to see one, it will generally fade after a few minutes. The really amazing ones might last all of five minutes. But on Oahu, rainbows would appear and 15 or 20 minutes later would be still going strong. I was painting this scene one day when a rainbow appeared. Originally, I had not thought of adding one to this painting, but could not resist! 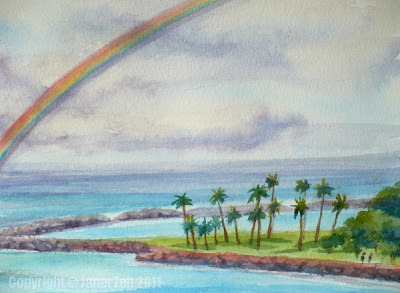 This painting is sold, but you can find other Hawaii seascapes here. Mahalo! Thanks for stopping by.